VIZ Meda Announces "Fullmetal Alchemist: The Complete Four-Panel Comics"
VIZ Media Announces "The Complete Art of Fullmetal Alchemist"
VIZ Media Announces "Fullmetal Alchemist: Fullmetal Edition"
Fullmetal Alchemist is a shonen manga written and drawn by Hiromu Arakawa. The manga was serialized in Japan's Shonen Gangan magazine from 2001 to 2010 and was collected in 27 tankobon (trade paperback) volumes. VIZ Media published an English language edition of the manga in North America as a series of graphic novels. Fullmetal Alchemist's story focuses on brothers Edward & Alphonse Elric. The duo engages in a forbidden alchemical ritual in an attempt to bring their late mother back to life. However, the ritual goes wrong, causing Edward to lose a leg, while Alphonse loses his entire body. Edward grafts his younger brother’s soul into a suit of armor, a process which also costs Edward his right arm. Edward replaces his own missing flesh with “auto-mail” limbs, and he eventually becomes a state alchemist in service of the Amestris state military. Edward searches for the legendary Philosopher’s Stone, the one thing that can restore the brothers’ bodies. Like many manga, Fullmetal Alchemist included with the main narrative what are called four-panel comics. Four-panel comics are generally gag comic strips that play with a series' characters, plots, stories, and settings in a humorous manner. They are usually four panels in length and are printed vertically. 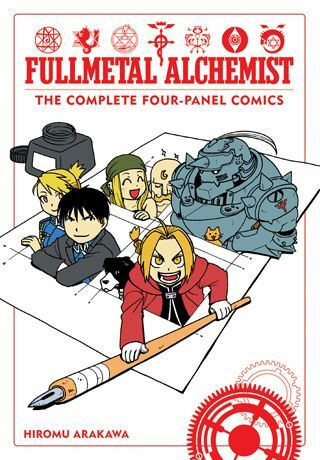 Fullmetal Alchemist: The Complete Four-Panel Comics is a new single-volume paperback book from VIZ Media. It collects the four-panel comic strips from Hiromu Arakawa’s original Fullmetal Alchemist series. In a addition to the four-panel strips from the Fullmetal Alchemist graphic novels, this book publishes the four-panel comics that were included in the DVD collections of the Fullmetal Alchemist anime (including the “Fullmetal Alchemist: Brotherhood” series) and other Fullmetal Alchemist related products. This book also includes some never-before-published bonus comics. THE LOWDOWN: My VIZ Media representative sent me several volumes of the Fullmetal Alchemist manga during the series' original North American publication. He also sent me Fullmetal Alchemist: The Complete Four-Panel Comics. I won't kid you and say that all these Fullmetal Alchemist four-panel comics are great, but many are funny, in fact, surprisingly so. Fullmetal Alchemist can be such an intense narrative, so it is nice to see so many of the characters, especially Ed and Al (Edward and Alphonse Elric) in a funny light. Honestly, there were points during my reading of this book in which I thought that these four-panel comics were making a convincing argument that there are at least several chapters worth of humorous manga to be mined from the world of Fullmetal Alchemist. POSSIBLE AUDIENCE: Fans of Fullmetal Alchemist will want to experience the sunny side of Fullmetal Alchemist: The Complete Four-Panel Comics.